First Class State-of-the-Art with all the latest and greatest fitness equipment. 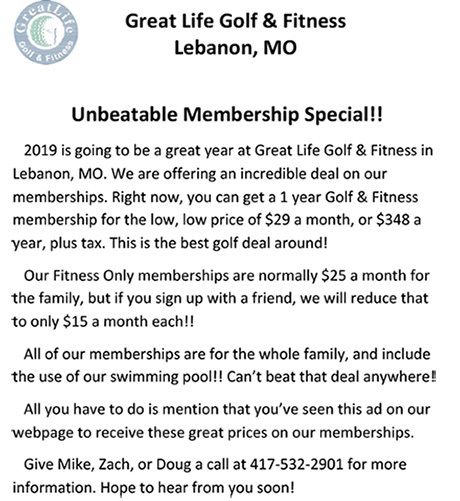 Formerly Lebanon Community Golf and Country Club... a semi-private, eighteen hole championship golf course located two miles west of Lebanon, Missouri and nine miles east of Bennett Spring State Park (great trout fishing) on State Highway 64 West. The Lake of the Ozarks, a vacation, fishing and boating destination, is only thirty miles north as well. For the last sixty years, the course has provided a challenging golf experience for players of all abilities. We are open year round, with the exception of Thanksgiving and Christmas Day, weather permitting. The course features a driving range, putting green, and chipping green with three sets of tees stretching to 6435 yards. Gently rolling hills offer a track that affords elevation changes, large contoured greens, water hazards, a large "sinkhole" on the Par 3, Sixteenth hole, and numerous options in shot selection on the Par 4's and 5's. The Par 4, Fourth hole presents an opportunity to cut a 90 degree dogleg left over trees with your drive to possibly reach the green or play it as a conventional Par 4. The Ninth and Eighteenth holes share a huge green divided by a large bunker, that can make for some interesting, lengthy putts. With a mix of tight, tree-lined fairways and some that are more forgiving, the course definitely presents a variety of play. Feel free to peruse our site to gather more information concerning Tee Times and Rates, Current Golf Specials, Golf Course Layout and Information, and Links to Area Tourism Information. Our goal is to be an exceptional, player friendly golf facility offering high quality service to both members and guests. We welcome individuals, families, and all groups to our Club. Our friendly staff and finely maintained course will make for a fun day of golf for all players. We look forward to your visit. Come see us soon!